Mulled cranberry apple cider is a cozy warm drink that’s easy to make. 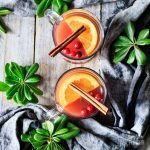 Serve this fragrant homemade drink at a Thanksgiving dinner or festive Christmas party. The delicious flavors of apple, cranberry, orange, brown sugar, and spices make this fall drink a real crowd pleaser. There’s nothing better to drink on a chilly autumn day than a glass of steaming cranberry apple cider. It truly warms you up from the inside out! What does it mean to mull cider? Mulling means to cook the cider with aromatic mulling spices, such as cinnamon, cloves, allspice, or nutmeg. Heat and time bring out the flavor of the spices, giving the cider a beautiful aroma and rich spiced flavor. Does apple cider have alcohol in it? No, it doesn’t. Apple cider is simply unfiltered apple juice that may or may not be pasteurized. Unlike cider, apple juice is filtered to remove apple particles and sediment in addition to being pasteurized for a longer shelf life. However, the naturally occuring yeasts in unpasteurized apple cider may ferment over time, making the cider fizzy and giving it an alcoholic content. How do you make hot mulled cider? Grab all the ingredients. Apple cider, cranberry juice, orange juice, brown sugar, crystallized ginger, spices, a fresh orange, and fresh or frozen cranberries. Pour the juices into a large pot and stir in the brown sugar until dissolved. Add the mulling spices (we’re using cinnamon, cloves, and allspice), crystallized ginger, fresh cranberries, and three orange slices. Cook for 10 minutes, or until desired flavor is reached. Feel free to taste throughout the cooking time. Once the cider has mulled, pour it through a strainer to catch the spices, cranberries, and ginger. Pour the cider back into the pot or into a slow cooker to keep warm. When you’re ready to serve, garnish each glass with a few cranberries, a slice of orange, and a cinnamon stick. Enjoy! Tie up the cloves, allspice, and crystallized ginger in a piece of cheesecloth to create a spice sachet. It will make it much easier to remove the spices. It’s best not to let the mulling spices sit too long in the cider, as they will make it bitter. Keep the cider warm on the stovetop over low heat, or in a slow cooker on warm. Store leftover cider in the fridge for about 3 days. Reheat before serving. Have leftover apple cider, cranberry juice, or orange juice? Freeze them and use the juice for another batch of cider later. These other fall drink recipes are sure to be a hit with your family. Mulled Apple Cider: traditional apple cider is cooked in a crock pot with orange slices and aromatic spices. Festive Wassail: a fabulous blend of citrus and fruit juices mulled with warm spices. Sparkling Cranberry Mocktail: the surprising combination of cranberry and rosemary makes this drink one to remember. Share your thoughts on this mulled cranberry apple cider recipe by leaving a recipe rating below. Chop the crystallized ginger into smaller pieces. Rinse and slice the orange. Put the cranberries in a small sieve and rinse, discarding any spoiled berries. Pour the juices into a large Dutch oven set over medium heat. Add the brown sugar and stir until dissolved. Dump in the crystallized ginger, cinnamon sticks, cloves, allspice, three orange slices, and half of the cranberries and stir to mix everything together. Cover and bring the mixture to a boil over medium heat, stirring occasionally, then turn the heat down to low and simmer for 10 minutes. Taste the cider. If you like the flavor, pour the cider through a strainer set over a large pitcher to remove the spices. If you would like a stronger spicy flavor, let the spices mull for another 10 minutes, or until desired flavor is reached. Pour the strained cider back into the pot or into a slow cooker and add three fresh orange slices and the remaining fresh cranberries. Cover and keep on low heat until ready to serve.